When I was growing up, I don’t recall there being much debate. The number seemed generally stable from year to year. When the neighbourhood’s teens felt they were getting too old to be trick or treating, younger kids were replacing them. And if I remember correctly, 60 to 70 kids seemed to be the norm for many years. When it came to Halloween, it was suburban stability. Also, back then, Halloween candy didn’t grace our store shelves until after the “Back-to-school” season was over… when kids were back at school. I don’t recall any retail shenanigans of having Halloween candy on the shelves a couple of weeks into the summer break. In the couple of weeks leading up to Halloween, Mom would buy 60-70 treats. On Halloween night, most (if not all) of the treats would be distributed. The end. 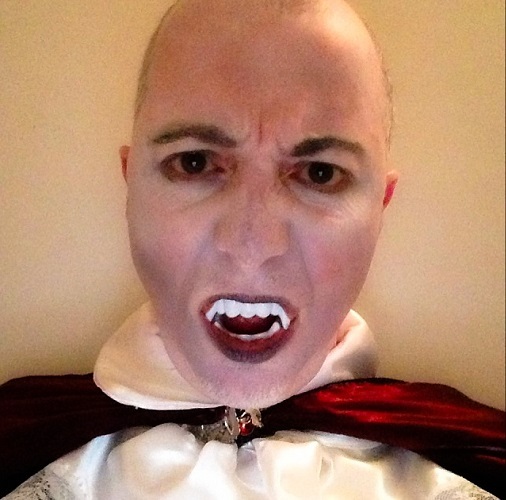 Over the years, I haven’t been one to shy away from dressing up for Halloween (… or any other day of the year, when the occasion called for it). I have always found it to be a lot of fun to step out of character for a day and take on another persona for the pure fun it. Over the course of a half-century, I have had plenty of opportunities to try on different costumes. What surprises me is that the ones that seem to be the most memorable were not necessarily the store-bought ones, but the ones that involved an injection of creativity to complete the look. The most memorable store-bought costume had to be my favourite cartoon character, Bugs Bunny. Because I wasn’t in growth spurts around that time, I am pretty sure I wore it for (at least) two consecutive Halloweens. It was pretty simple really, a grey polyester jumpsuit with a white chest and belly that I could hop in and out of in seconds, and a plastic mask with a little elastic in the back that needed a little reinforcing for the second year. Add a carrot, fresh from our garden, with the stems still on and I was as happy as a clam. It really was a simple pleasure.